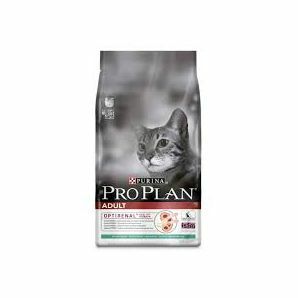 PRO PLAN Chicken & Rice Formula for Adult Cats is made with quality chicken and highly digestible rice for exceptional nutrition and palatability. Chicken, the main ingredient, provides a delicious source of protein to support strong and healthy muscles. It is specially formulated to help bolster your cat's key protective systems - the immune system, digestive system and skin and coat system - and supply the energy and nutritional needs of a healthy adult cat. The recommended daily amounts should be adjusted according to weather conditions, the animal's level of activity and its physical condition. Clean, fresh water should be available at all times. Store food in a dry and clean place at ambient temperature. SKIN: Vitamin A, Linoleic acid and Zinc aid skin elasticity and hydration. COAT: Marine oils for a thick and glossy coat. TEETH: A special coating that has been proven to significantly reduce tartar accumulation by up to 40%. DIGESTION: Wholesome cereal grains and rice for easy digestibility and optimal uptake of nutrients. RENAL: Renal system efficiency preserved by essential minerals and urinary pH control. IMMUNE: High levels of quality protein and strong antioxidants to help antibody production and cell protection.